Edmund John Miller was born on August 30, 1894, on a farm in the vicinity of Urbana, Iowa. He was the second of eight children born to Norman and Philomena Miller, both of French and German descent, who had migrated to Iowa from New York City. The family moved to another farm near Vinton when young Edmund was about six months old. The Millers had three sons and five daughters: Eugene, Edmund, Ralph, Alvina, Norma, Matilda, Ida, and Mary. Ralph was nearly five years younger than "Bing," but made it to the major leagues the same season, pitching a 1-2-3 inning in one game for the Washington Senators in 1921. Because Norman had played a bit of minor league baseball, it was no stretch that his sons carried out the family tradition. It was Eugene who first dubbed young Edmund with the moniker "Bing," the name having come from a character in a comic strip that ran in the local newspaper, the Vinton Eagle. The character's name, "George Washington Bings", was appended to Miller first as "Bings," but later simply "Bing." Miller's professional career began at 16 when he joined the Vinton Cinders. By 1912 he was the pitcher in the (Bing) Miller - (Eugene) Miller battery, and performed well enough to attract the attention of teams from both Cedar Rapids and Clinton. When he turned 18, he opted for the $80 monthly salary from Clinton (a $10 advantage over the Cedar Rapids offer), and joined the Central Association. Over the next three seasons with Clinton, he continued to improve as a pitcher, once running off a ten-game winning streak before hurting his right arm. His talents as a hitter, however, were such that he was retained and switched to the outfield. "Organized baseball" was a loose term in the first two decades of the century, and lack of oversight led to Miller being sold twice by the Travelers, to both the Washington Senators and the Pittsburgh Pirates. Kenesaw Mountain Landis, who had become commissioner in November 1920, was forced to decide which team owned Miller's contractual rights; he eventually ruled in favor of the Senators. Miller made the Senators squad in 1921. He was an old rookie at 26, but hit .288 over 114 games during the campaign. 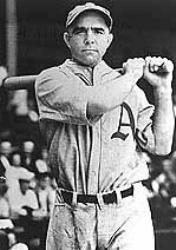 Despite his success, he was traded to the Philadelphia Athletics as part of a 3-team deal that winter. Washington sent Miller and Jose Acosta to the Athletics, and Frank O'Rourke to Boston, while Philadelphia shipped Joe Dugan to the Red Sox. To complete the deal, Boston moved Roger Peckinpaugh to the Senators. Statistically, age 27 is considered "prime of the career" for many ballplayers, and Bing Miller was no exception. In 1922, his second major league season but at the age of 27, he hit what would prove to be a career-high 21 homeruns (fourth in the American League) and slugged at a .551 clip. He finished fifth in the batting race (.335), sixth in total bases, and fifteenth overall in the Most Valuable Player voting. Despite his prowess at the plate, manager Connie Mack had a surfeit of talent in the outfield, and beginning in 1924 Miller occasionally saw time at first base. By 1926, coming off batting averages of .342 and .319, he was expendable. In June, the Athletics traded Miller to the St. Louis Browns for Baby Doll Jacobson. The change of scenery evidently reinvigorated Miller's bat, as he hit .331 for the rest of the 1926 season, and followed that with a .325 average in 1927. The Browns, being the Browns, were always on the prowl for a better deal...something...anything...that might improve their league standing. In December 1927, Connie Mack rescued Miller from oblivion by sending Dolly Gray to the Browns in a straight-up trade. Miller played the 1928 season as a senior citizen, a 33-year old rightfielder who still hit well enough to finish sixth in the AL batting race with a .329 average. In a category of more dubious distinction, he led the loop in being hit by pitches, getting plunked eight times over the course of the schedule. The team finished in second place that year, though, presaging the championship efforts of the next three seasons. The Philadelphia Athletics dominated the American League in 1929, and Miller was a significant contributor to that success. He logged a career-high in base hits (184, including 16 triples) on the way to hitting .331, and stole 24 bases over the regular season. He also posted a 28-game hitting streak, and topped that by hitting .368 in the World Series against Cubs that year in buttressing a 4-1 Athletic victory. On October 14, at the end of Game 5 at Shibe Park in front of President and Mrs. Herbert Hoover, Bing Miller snatched a small but permanent spot in the lore of the game. The Cubs' Pat Malone had held the Athletics scoreless through eight and one third innings of a masterful pitching performance, and the game was just over an hour-and-a-half long at the start of the ninth. The Cubs led the game 2-0, but Philadelphia nosed its way back to a tie with a Max Bishop single and Mule Haas homerun. Malone maintained his composure, and enticed Mickey Cochrane to hit a ground ball for the second out. Sadly, though, the tragic mythology of the Cubs is built on real heartbreak. An Al Simmons double and an intentional pass to Jimmie Foxx brought Bing to the plate with the series on the line. Miller promptly smacked a double off the score board, and the Athletics took the game 3-2 and the Series 4-1. Following the stunning conclusion of the 1929 season, in early 1930, Miller married Helen Fetrow of Philadelphia. Marriage appears to have agreed with him, at least on the diamond, as the Athletics followed up with another world championship. During that 1930 season Miller led the team in games played, at-bats, and steals, and drove in 100 runs, the only 100-RBI year in his career. The team earned a third consecutive American League pennant in 1931, and nearly claimed a third straight World Series, falling to the St. Louis Cardinals in seven games. This marked the end of the glory days in Philadelphia, though, and by 1932 Connie Mack began changing the Athletics roster. Back in Philadelphia, young Doc Cramer, a rising talent in the outfield, forced Miller to take up the art of pinch-hitting. After 1932, Miller never had more than 197 plate appearances in a single season. He was also, in 1933, the eighth oldest player in the league. In a sport for boys, Miller's days were dwindling. He could still hit, though, and became one of the most oft-used pinch hitters in the league. In 1934, Bing had traded his jersey number "9" for a "27," thus cementing his "bench status," but he was still considered talented enough to be included on a roster of major leaguers barnstorming through Japan. On January 14, 1935, Miller was sold to the Boston Red Sox, and he led the loop in pinch hits with 13 that season. In 1936, Bing Miller was the oldest player in the majors (age 41), and appeared in only 30 games over the entire year. He played in his last big-league game on September 5, and on September 28 the Red Sox named him to replace Al Schacht as a coach. Miller remained in Boston through the 1938 season, then coached for the Tigers between 1939 and 1941. After 1941, Miller moved along to the White Sox, now managed by former Athletics teammate Jimmie Dykes, and stayed with them through the 1948 campaign. Of interest is his draft registration card filed in 1942 (at age 47) for service in World War II. Miller lists his height as 5' 7", and weight as 170 pounds. This contradicts the media-guide and encyclopedia statistics that describe him as 5'10" and 185 pounds. In 1950, Miller took the final job of his coaching career with Connie Mack and the Athletics, and stayed with the organization until 1954, after which the team moved to Kansas City. Upon his retirement from baseball, the town of Urbana, Iowa, held a day in his honor, and still cites him as one of its favorite sons in Chamber of Commerce publications. Miller's contributions to the game extended beyond the foul lines. Over the winter of 1930, a young Iowa pitcher from the nearby hamlet of Norway came by for a visit, searching for some guidance as he pondered his own baseball future. Miller had heard of the boy, Harold Trojovosky, and of his talents on the mound and in the batter's box. Eastern Iowa, in the days before mass communication, was a neighborhood unto itself, and once young Hal came under the scrutiny of the St. Louis Cardinals, Miller wasted no time in telling the young man to wait a bit until Connie Mack could weigh in. It was Bing Miller's interest that convinced Hal Trosky that he should seriously consider professional baseball, and on the drive home that afternoon, Trosky decided to give the game a chance. Bing Miller never lost his love for baseball. He was a lifetime .311 batter, and hit over .300 eight times. He earned two World Series rings with the Athletics, played in a third, and coached in one with the Tigers in 1940. It was part of a lifetime of memories. By 1966, he was a widower living in Wynnewood, Pennsylvania, a suburb of Philadelphia. On Friday, May 6, Miller made his way to old Shibe Park, renamed Connie Mack Stadium in 1954 but still the site of Miller's greatest playing successes, for a night contest between the hometown Phillies and the cross-state rival Pirates. The game lasted over 3 hours, and covered eleven innings, but the hometown nine won 8-7. Driving home that night, Miller (whose vision was possibly impaired after having had a cataract removed in 1960) was injured in a car crash. He was rushed to Presbyterian Hospital in Philadelphia, where he died six hours later, on May 7, at age 71. At the scene of the crash, according to his obituary in the New York Times, "...a policeman recovered his diamond tie clasp with the inscription '1930 World Champion'." He held on to those precious memories to the very end. He is buried at Calvary Cemetery, in West Conshohocken, Pennsylvania. Edmund John "Bing" Miller loved baseball, and he was a contributing member of one of the greatest teams ever to take the field. In 1960, he received a whopping six votes for the Hall of Fame, but that doesn't begin to capture the contribution of the right-hander from Vinton, Iowa. His 1,934 hits, 993 RBIs, and 116 homers represented a fine career, but Bing Miller was a baseball man through-and-through, and within that profession there is no higher praise. McGrane, Bert; "Hall niche to Bing Miller, Hero of '29 World Series." Des Moines Register, March 26, 1961. Unpublished Biography; Hal Trosky (for SABR Bioproject), by W.H. Johnson. In progress. New York Times, Sunday, May 8, 1966.